More than one hour in length, this high quality production clearly and simply demonstrates the essentials of etiquette, falling, avoidance & basic movements and all Dai Ichi Kihon techniques (Yoshinkan First Level Basic Techniques). Each technique is demonstrated multiple times, at slow and fast pace. Locking techniques also include close-ups for ease of learning. Included are a wealth of extra features of interest to both new and intermediate students. Also, the menu of this disc was designed for easy repeated viewing and fast switching between chapters. 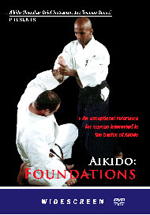 All up, this is a great visual reference for teachers and students of Aikido alike.